This video will show you how to set-up Google Chromecast as well as an Unboxing & Review. This video will show you How to Create an iCloud Account on an iPhone, iPad or iPod. So I wanted to do a tutorial on how to find a lost iPhone, however to do this you first of all need an iCloud account. First port of call needs to be how to setup an iCloud account on an iOS device. What is this iCloud I speak of? Well it is a backup service that allows you to save all your music photos and files to Apple’s servers and sync those files to all of your devices via the internet. This is what they call cloud computing and in Apple terms iCloud. Step 1. Make sure you update your iPhone, iPad or iPod. You can do this in Settings, General, Software Update. Step 2. Turn on iCloud. When you get a brand new iOS device, at the very start when you are setting up the device it asks you do you want to Set Up iCloud. There is a skip button which will allow you to skip this part. If so you will need to setup iCloud by going into the Settings icon on the Home screen, select iCloud and you will be prompted for your Apple ID. This is the same ID you use for iTunes. Otherwise you can just log into iCloud and use your Apple ID. Step 3. Once you are logged into iCloud your can Customise your settings. Tap the Settings icon and go into iCloud and then you can toggle on and off any services you want or don’t want to sync with iCloud. Step 4. If you want to you can turn on Mail and get a free iCloud email account. Its apparently ad-free. However its just another option. Pretty sure most users out there already have a free email account and don’t need ANOTHER email account haha. Step 5. Setup your iCloud to automatic download your music, apps and books. To do this go into Settings and select iTunes & Apps Stores. Toggle on your music, apps and books. Step 6. Turn iCloud on all of your other devices so you can get access to your files anywhere. Stay tuned for the next video will with show you how to find your iPhone when it goes missing. Related 123 my IT Videos. How to setup a Yahoo mail account in Microsoft Outlook 2013. This video will show you how to setup a Yahoo mail account in Microsoft Outlook 2013. How to setup a Gmail account in Outlook 2013. This video will show you how to setup a Gmail account in Outlook 2013. 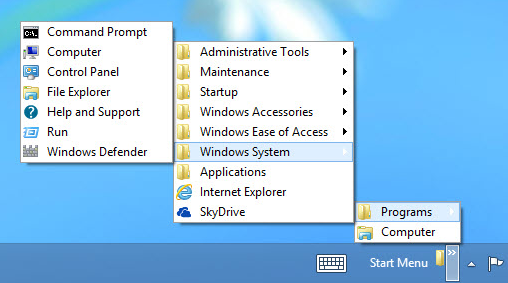 How to add a Windows 8 Start Menu Tip 2. This video will show you how to add a Windows 8 Start Menu. One of the things that annoys people about Windows 8 is the missing Desktop’s Start menu. Microsoft tried very hard to remove the Start menu but fell short as you can use free or paid add-on programs to get the Start menu back. If your cheap like me and don’t want to spend the money to get an app to put the Start menu back then you can add a Start menu on the taskbar by doing the following steps. Step 1. Right click the Desktop. Step 2. Go to New then Folder. Step 3. Paste the following string. You need to replace username with the name of the user you are logged in as. Paste the url above into the Folder bar and you are good to go. You should then see the new menu bar in the bottom right hand corner of the screen. To remove the Start menu you can just right-click and select Toolbars, then untick the Start Menu Toolbar. When you right click the taskbar and go into Toolbars you will see a whole heap of other pre-built toolbars which you can add to the taskbar. Address: This adds a box on your Taskbar, which allows you to type URLs. Simply type a URL, press Enter and you will go to that website. Links: This shows your Explorer favorites on the Taskbar. Touch Keyboard: This shows a keyboard icon on the Taskbar. When you Click on it, it will display an onscreen keyboard. Desktop: The Desktop toolbar displays every icon on your Desktop. It even displays items such as Homegroup. How to setup GodMode on Windows 8 tip 1. This video will show you how to setup GodMode on Windows 8 computer. The step by step guide on how to setup “God Mode” on Windows 8. If you have just purchased a new pc you might notice that there is loads of hidden settings where by you can customise Windows 8. However the settings are scattered throughout Windows 8 and it can take time to find them. This is where “God Mode” comes in. While the term “God Mode” sounds like something from a Doom game, “God Mode” in Windows 8 is really a hidden folder that allows you to get access to all the settings in Windows 8 that are spread out through the Microsoft operating system. Make sure you have turned hidden files and folders off. To do so go into Explorer, click the View tab and tick “Hidden items” and “File name extensions”. Then follow the steps below. Step 2. Go to New > Folder. If you have followed the steps correctly you should see the folder icon change to the icon in the picture above. When you double click the GodMode icon you will see a folder full of settings and tools, from “Change User Account Control settings” to “Check for updates.” These settings are organized by category. You can open or close each category by click on the triangle next to it. The category’s have a number in brackets beside them which represents how many settings there are in it. Double click any of the settings and it will take you directly to the setting with in Windows 8. In some cases you will get a wizard screen where you need to follow the prompts. In other cases you will be sent to the control panel or other Windows 8 settings screens. How to setup Yahoo mail on a Mac using Mac Mail. Step 3: Select an account type, In this example we are choosing Yahoo.